We just got our shipment of the Adonit iPad Stylus/pens… they are as ‘interesting’ looking in person as they are in the online pictures. 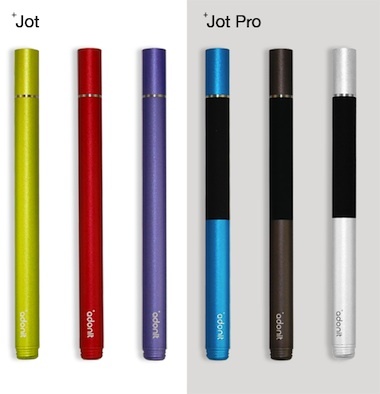 Adonit has two versions of their ‘Jot’ pen, Jot and Jot Pro. First, the important stuff… these are heavier pens that feel more like a fancy metal ball point ink pen than a hollow barrel stylus. They have a screw on cap that covers the tip when in transport that also screws on the non-writing end when not in use… a simple thing that we have yet to find with other stylus options. You will notice that the Pro has the addition of a rubber ‘grip’ that adds to a natural pen feel. Non of the options have a pocket clip but the Pro carries magnets so you can sit the pen on the edge of your iPad2 and it will stay there. Warning, placing the pen on the right side of your iPad2 or front edge of your newer MacBook Pro will sleep the devices. The MacBook was a funny find when the Jot Pro was in a coworker’s hand jumping back and forth between writing on the iPad2 and typing on his notebook. Of course, your wondering how that interesting looking plastic flat tip is to use. We are comparing it to our standards, the Griffin Stylus and Acase small tip stylus. The small metal ball pivots in the clear plastic floating disc. This means you can tip the Jot up to a 40 degree angle to best match your writing style. The tip glides smoothly across the screen and has a more solid feel when writing. It is a hard surface moving across a hard surface while our other iPad pens have a slightly squishy hollow rubber tip. So, when the stylus touches the screen, there is no movement which feels natural but took a bit to get used to since we were used to our previous stylus options to compress a bit. For long time pen based computing users, the solid feel does bring back the days of little plastic pens that had a tendency to pick up dirt and scratch our digital device’s screens. Non of our team in the last two days have seen this to be an issue of the larger plastic disc on the Jot. The clear disc around the Jot tip means you can see exactly where you are writing. Like we have said in previous iPad pen reviews, the size of the tip does not mean you have smaller electronic ink on the page, that is a function of the app your using. Instead, you are better able to see to write cleaner letters which can be closer together. 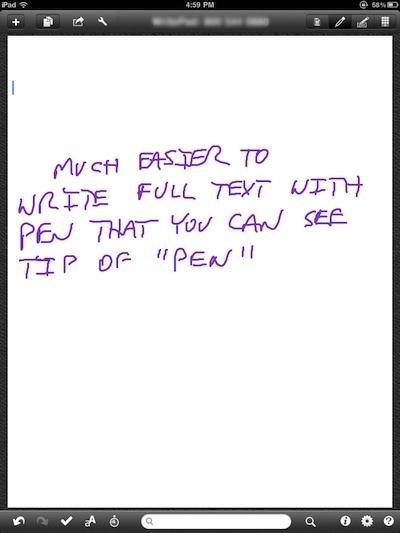 We use NoteTaker HD for our handwritten meeting notes all day long. 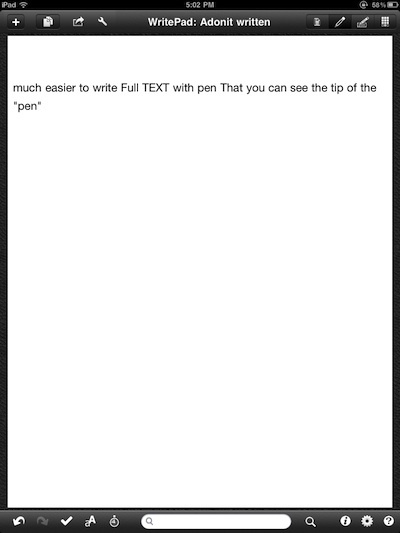 Below is a screenshot of the ‘standard’ rubber tip stylus at the top of the page and the Adonit Jot along the bottom. Of the two groups of text, the upper text was written on the note page while the lower line of text of each where entered through NoteTaker’s text entry window. The problem with this test is that everyone in our office is used to using the rubber tipped standard iPad stylus every day. They are used to adjusting the way they write to compensate for not seeing the exact point the stylus touches the iPad screen. For a true test, you need to find someone who has never used either tip types to know they are writing naturally. 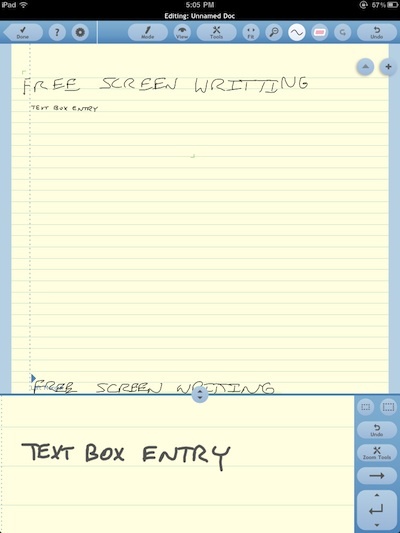 Below is a close up of the text writing box writing in the same Note Taker HD example. For a new iPad stylus users, this is where seeing the tip on the screen will make the biggest writing quality difference. The pen tip on surface precision is only part of the writing experience. 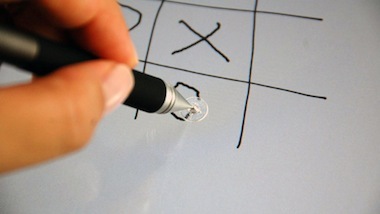 The other point that several folks commented on was the smoothness of the Jot stylus on the iPad screen. There is no dragging or skipping that some users get with a rubber tip. Again, the majority of us only know the standard stylus feel but for a person coming directly from pen and paper, the Jot disc feels familiar. 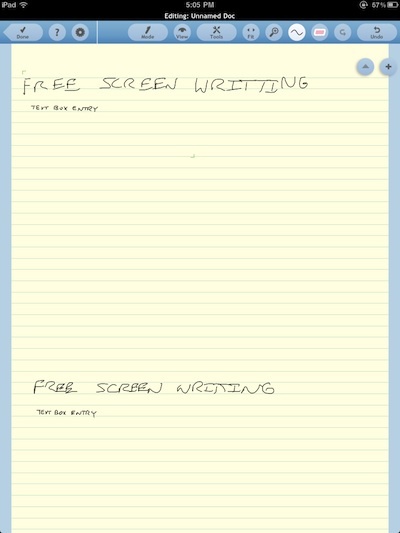 These smooth pen strokes show up mostly for folks that draw boxes and arrows like flow charts and users of WritePad. As a reminder, WritePad is the app many of our group uses that need their handwritten notes converted to typed like text which is done automatically for them as they write. The magnet is great when looking for some place to put the iPad pen in a meeting but isn’t strong enough to use while walking around. The tip makes it very easy to see exactly where your writing and is smooth to use. Returning the cap over the tip is a uncomfortable moment as we are concerned about breaking the tip… most likely not a problem but you can see everyone concentrate when they put the cap on. Getting the Jot out of it’s packaging, cut the black band across the middle on one side and the clear plastic tape across the top. The heavy feel of both styles and the rubber band of the Pro is VERY natural feeling.